Snow, sleet, rain, freezing rain -- we've seen it all. Through Wednesday morning, the main concern will be for a possible icy glaze if your temperature dips just below freezing. Some slick spots could develop for the morning commute, especially on bridges and overpasses. Also, in areas that saw some accumulating snow and sleet Tuesday night. 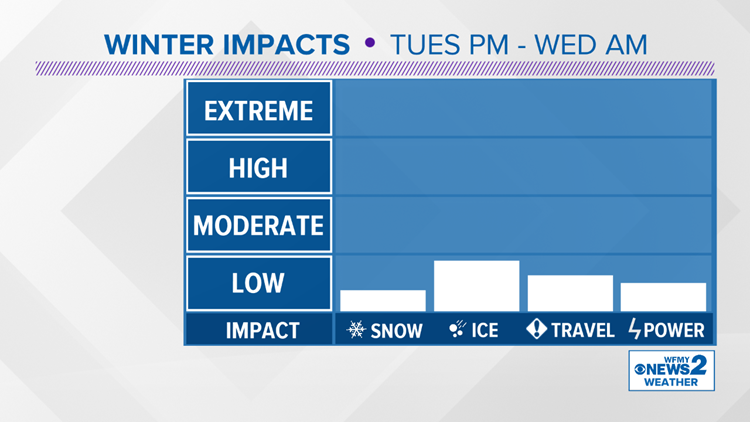 Here's what the WFMY News 2 Weather Team is tracking. 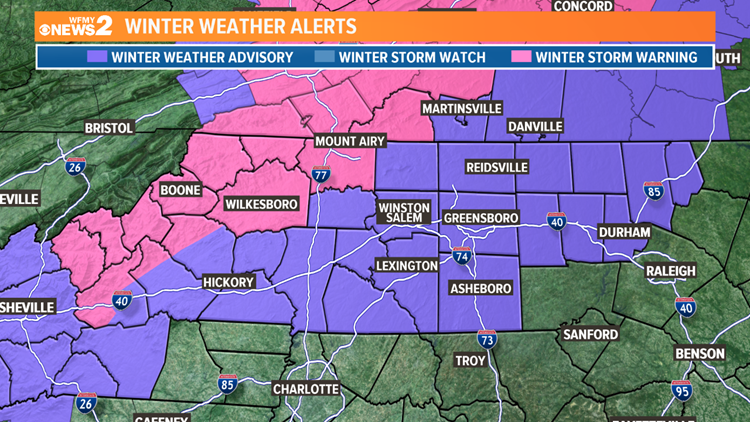 A Winter Storm Warning is in effect for Wilkes, Surry, Patrick and the NC mountains. Over a tenth of an inch of ice is expected here, as well as maybe some accumulating snow. A Winter Weather Advisory is in effect for in effect for most of the rest of the area. Up to a tenth of an inch of ice is expected here, mainly in the trees. The snow & sleet burst from last night over. As we head through this morning, we'll see a transition to rain and freezing rain. Whether or not you see an icy glaze will depend on if your temperature hovers just above freezing, or just below. Things will change to all regular rain by mid-morning when all of the Piedmont warms above freezing. Wednesday timeline. Watch for slick spots in the morning. 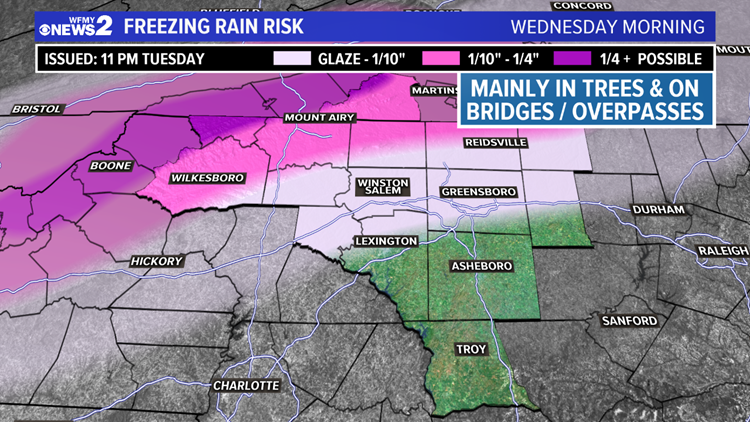 Most areas south of Greensboro will stay above freezing throughout the night, so an icy glaze isn't expected there. In the Triad, and north, an icy glaze to maybe as much as a tenth of an inch is possible, mainly in the trees and on elevated surfaces. Farther north, toward the VA border, a little more than a tenth of an inch of ice is possible. These areas have the biggest risk for slick roads and icy trees. Snow is over for this event. Many areas saw a quick burst of snow and sleet Tuesday night. It came down hard at times, and accumulated on cars, grass, and roofs. Generally a coating to a half an inch or so. 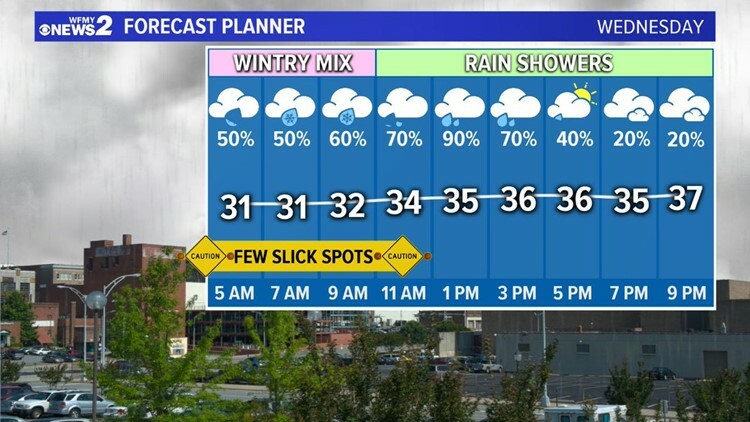 With temperatures warming above freezing through Wednesday morning the precipitation is expected to change over to all regular rain by midday. That will limit the amount of time that the ice will have to accumulate, which should also limit the impacts. There may be a window of time during the Wednesday morning commute where slick spots may develop on elevated surfaces, such as bridges, but road conditions will improve rapidly through the day. Ice may weigh down some trees north of I-40. Be on the look out for some slick spots on the bridges.